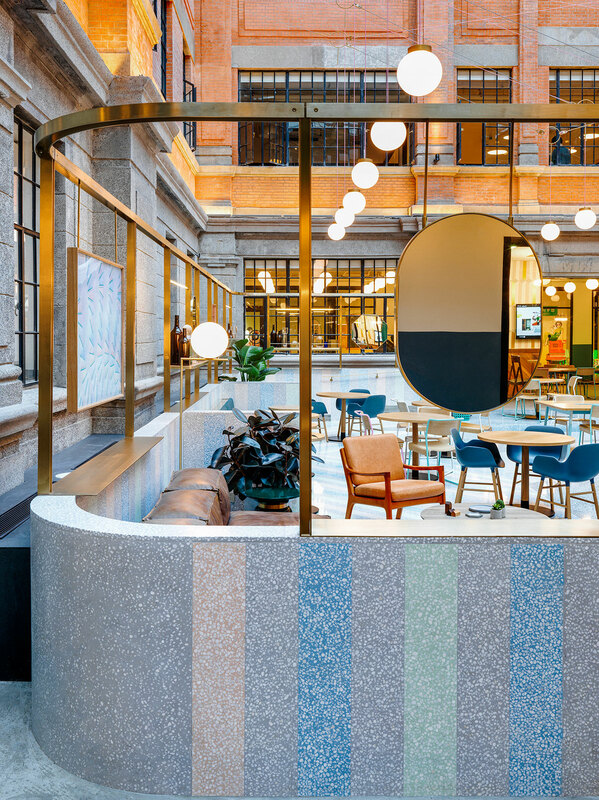 Eras and cultures playfully interact in Linehouse's design for the Chinese flagship location of the shared community office space WeWork in Weihai Lu, Shanghai. Completed in 2016, the five thousand five hundred square meters space is at once charming and quaint, respectful of the heritage of its ancient location while celebrating its thoroughly modern purpose. 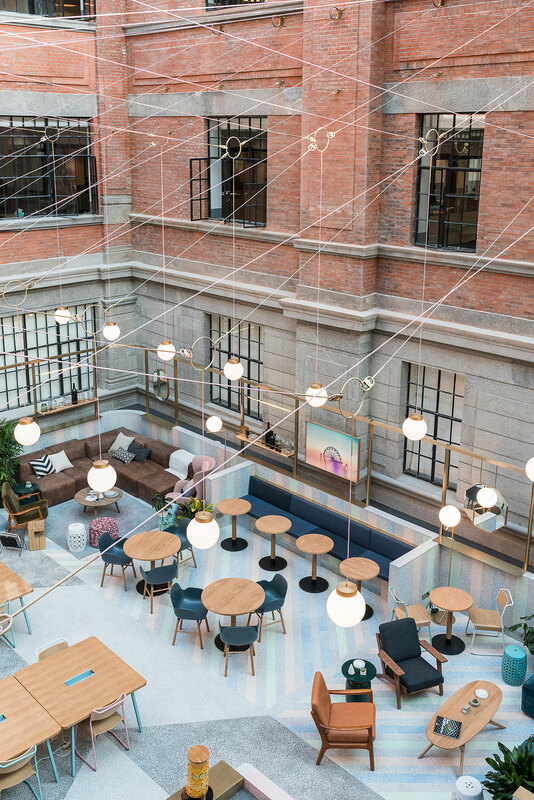 Originally constructed at the turn of last century as an opium factory and then converted into an artist's residence, the brick building located in an old residential district in the center of the city, has once again been transformed. 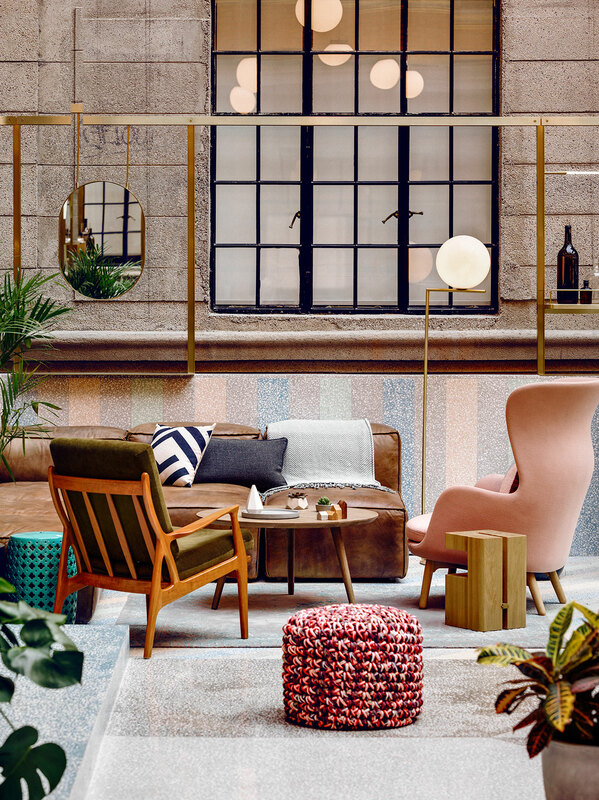 Its latest reincarnation boasts carefully thought out elements, all of which have been reinterpreted by the designers with an easy nonchalance, creating an environment that doesn't take itself too seriously but is fully equipped to offer the best for its tenants and their visitors. 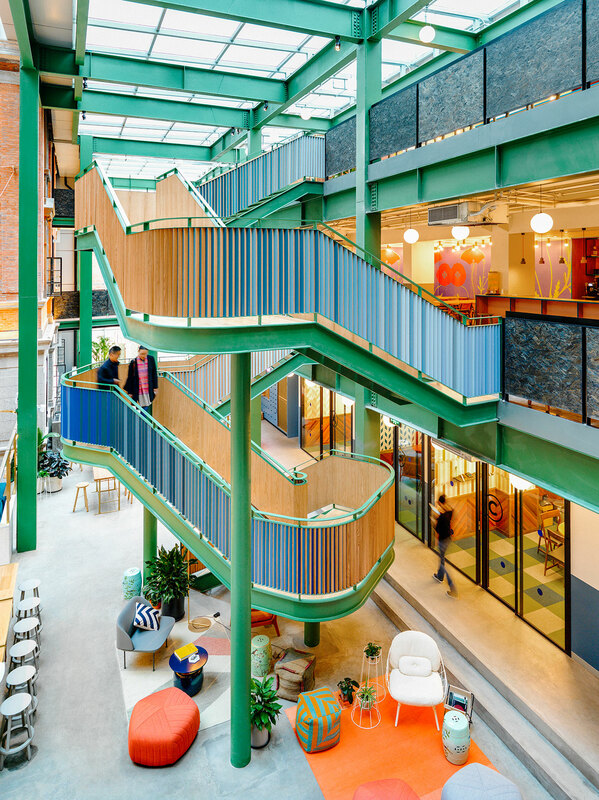 There's so much going on in the building's design that honing in on where to begin proves a challenge, as everywhere one looks proves to be more colorful and buoyant than the glance before it! 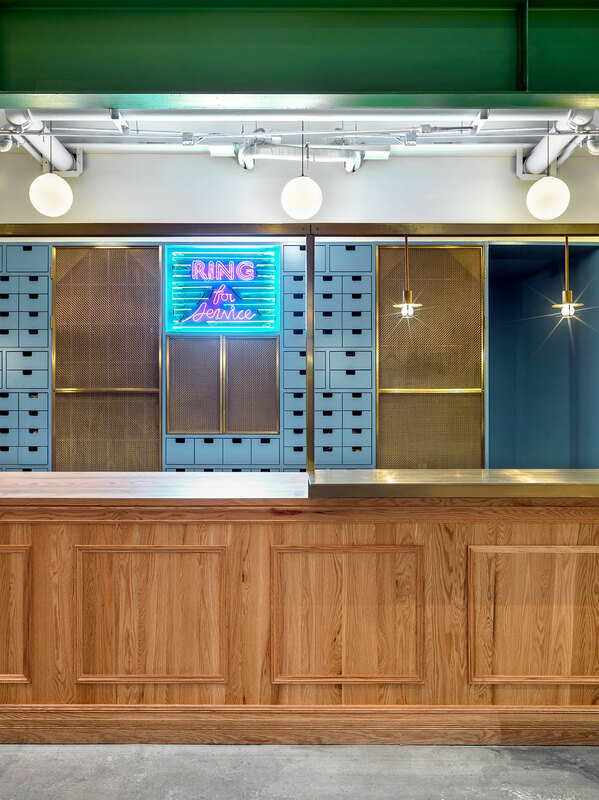 The first place members and visitors will be introduced and welcomed into this inspiring workspace is the reception where the concrete and carved wood reception counter surrounded by a bronze lighting structure and crowned by a cheeky pink and blue neon sign which reads "Ring for Service" Plays into the overall historical + industrial design ethic. 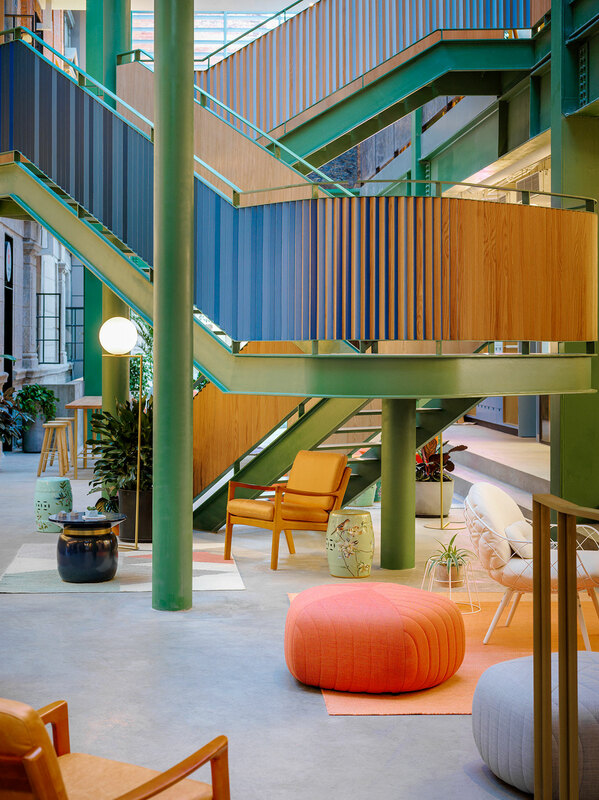 An overview of the space from any of the front of the building's three levels reveals a playful cohabitation of geometry, patterns and colors. 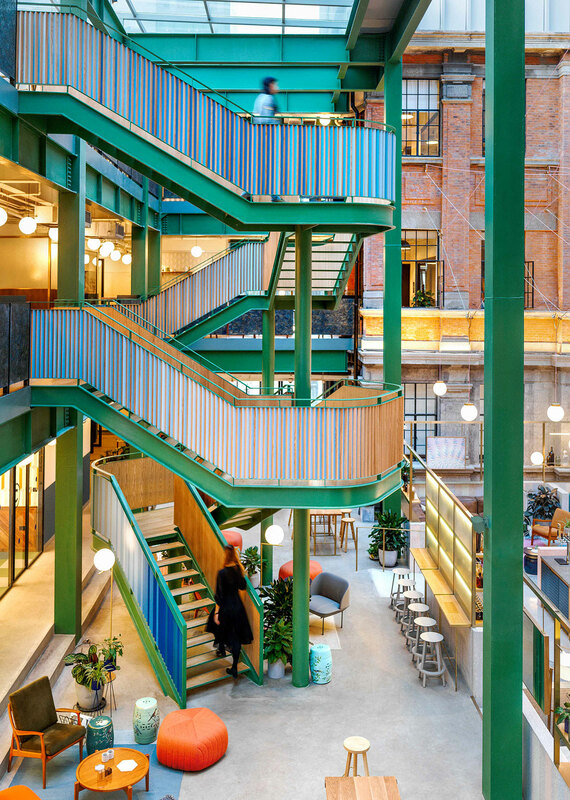 The industrial steel structure has been livened up by a coat of ivy green paint, as has the steel staircase which connects all three levels. But this is where a fun décor twist comes in, as one side of the staircase's oak cladding is painted in varying shades of blue so the colors "play peek-a-boo," alternating as one walks up or down the stairs. Another lighthearted touch, which harkens back to the building's original purpose as an opium factory, is the hand painted wallpaper featuring giant poppy's on a gold background on the two upper levels. 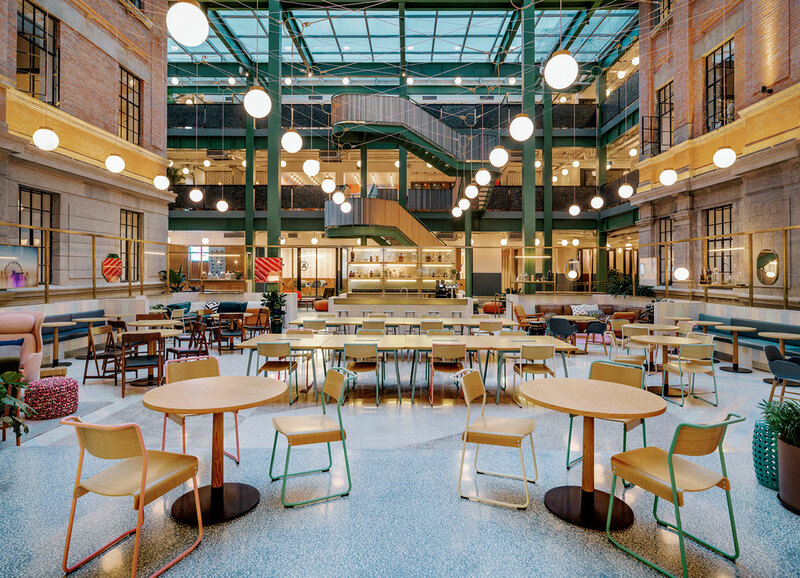 Meanwhile, the inventive lighting installation taking up the height of the three stories above the central atrium is certainly a sight to behold. 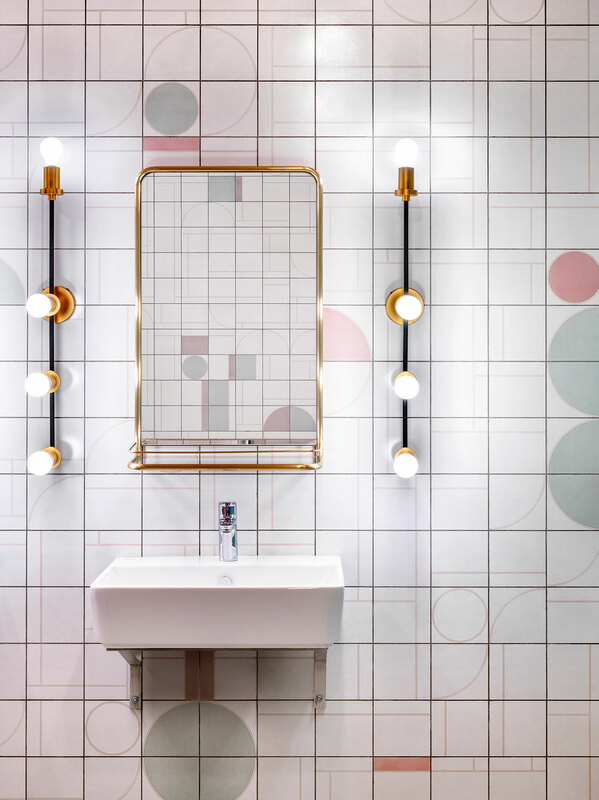 Created by meters of gray and pink cables onto which custom made glass light shades hang from suspended bronze rings, it bestows a sense of motion and energy to the entire space. 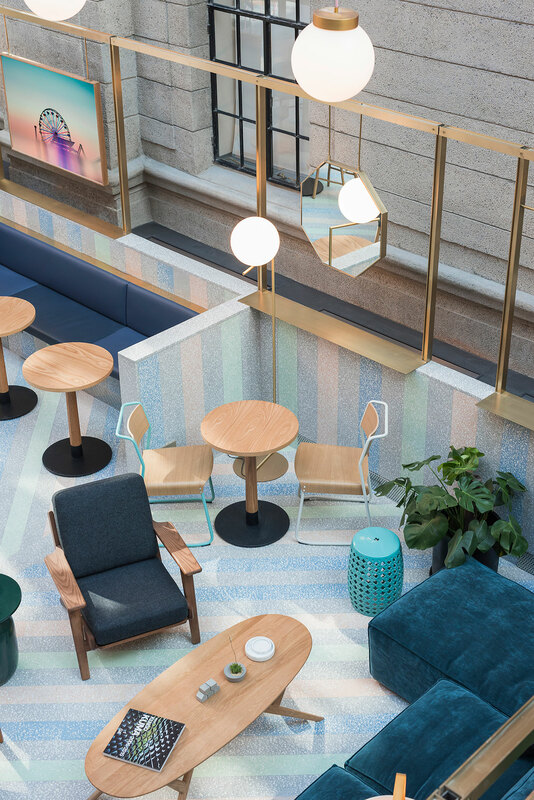 The liveliness hovering above the atrium is then mirrored by the diagonally striped floor, featuring a multihued combo of pale pink, gray, blue and green. 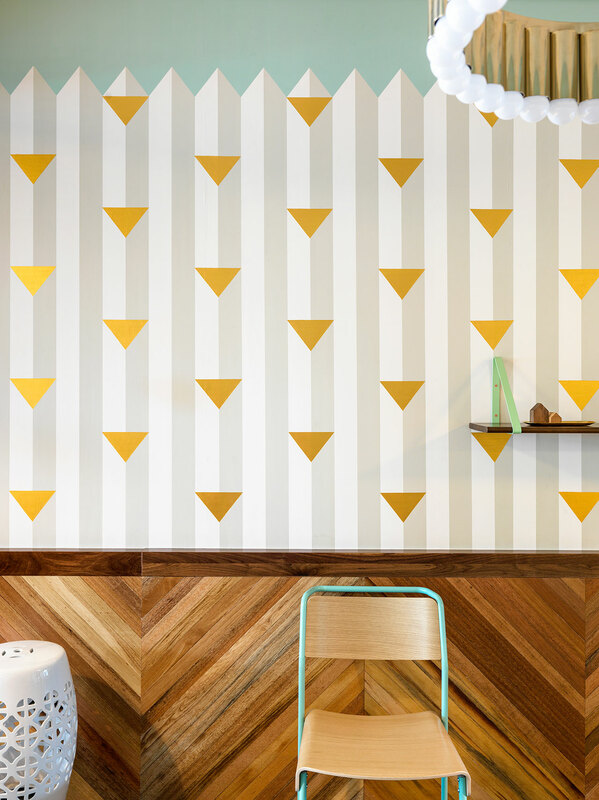 In fact, every spot in the building -from the custom printed tiles on the bathroom walls, to the gold wallpaper in the member's parlor featuring hand painted "Shanghai ladies" - that Linehouse has touched with an air of inventiveness, whimsy and stimulation, can't help but inspire all of the members of this shared workspace that whatever goals they reach for within WeWork's walls will most certainly be accomplished.